The PUrE Software has been used to assess the environemental, ecomonic and social impacts of switching to gas from electricity for domestic cooking. There is a belief that restricting domestic gas supply to urban centres will assist the UK in meeting its carbon reduction targets whilst also improving the health of its population. Clearly whilst alternative supplies can exist for space heating such as electric heating or hot water supplied via a district network, such a change will result in a forced move away from gas used for domestic cooking towards electric cooking. Whilst dwarfed by other energy uses such as space heating or various non-domestic applications, domestic cooking never the less represents a considerable energy use within the UK. In 2009 domestic gas and electric ovens in the UK used 6.5 TWh of energy whilst another 8.0 TWh were used by gas and electric hobs (DEFRA 2009). A further 2.4 TWh were used by microwave ovens and another 4.3TWh by electric kettles in the UK in 2009 (DEFRA 2009). In 2009 36% of domestic ovens were gas ovens with the remaining 64% electric. 55% of domestic hobs were gas with 45% electric (of which an unknown percentage are induction hobs that use on average 30% less energy) (DEFRA 2009). Without further policy influence the percentage of electric ovens are expected to increase to 70% by 2020 whilst the proportion of electric hobs are expected to fall to 40% (DEFRA 2009). The aim of this research is to use the PUrE software to assess the above 2020 scenario with the current 2009 scenario and another 2020 scenario where policy forces all users to use exclusively electric ovens and hobs. 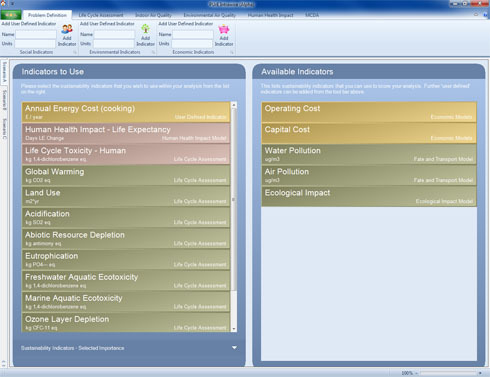 In order to reasonably assess these scenarios the PUrE Software will be used to asses the impact on various environmental, social and economic sustainability indicators. The analysis will look at changes to the domestic energy supply for cooking to the population of London, although any size population could have been selected. For all parts of the assessment this population given as 7,461,400 (ONS, 2006) will be the unit of analysis. Current 2009 scenario with 36% and 55% gas domestic ovens and hobs respectively. No policy intervention 2020 scenario with 30% and 60% gas domestic ovens and hobs respectively. Policy intervention scenario resulting in zero gas use for domestic cooking in 2020. The PUrE software allows the user to undertake their assessment using any number of environmental, economic and social indicators. For this assessment a number of environmental indicators were chosen to assess the impact of different energy generation whilst human health and economic indicators would be used to assess the more direct impacts of moving between gas and electric domestic energy for cooking. A wide range of assumptions have been made within this scooping study assessment. These include the physical layout of properties, the behaviour of occupants and the pollutant emissions released through cooking. Further assumptions are inherent within the models and tools used including indoor air quality, human health assessment and life cycle assessment. 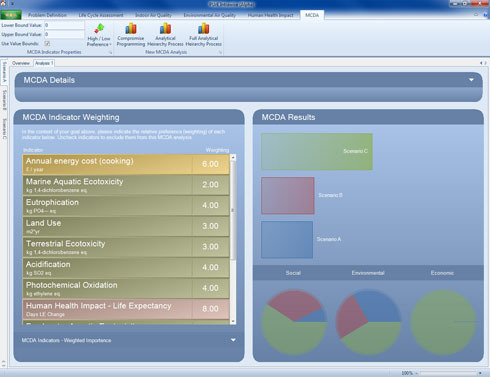 Using the integrated LCA tools and supplied LCA inventory data the impacts from implementing the above scenarios on a number of environmental indicators have been assessed. A variety of sustainability indicators were chosen including Global Warming, Acidification and Eutrophication. For the screening level study of this assessment the life cycle systems were limited to looking at the energy being used for the cooking alone, as opposed to the life cycles of the ovens and hobs etc. To that end three different life cycle systems were created, one for each scenario, each of which drew in different proportions of energy from gas and electricity to match the UK grid energy mix. With the life cycle systems set up for each scenario the PUrE Software calculated the environmental impacts for each scenario and recorded that data ready for the decision analysis later. Two social indicators were chosen for this assessment. Firstly, the change in Life Expectancy due to indoor air quality changes of those people whose domestic energy cooking supply has been switched; and secondly, the Human Toxicity derived from the Life Cycle Systems described above. The second of those was already calculated during the life cycle assessment described above. In order to calculate the direct impact of changing energy supply on life expectancy a number of tools built into the PUrE Software were used. The PUrE Software includes an interface to the indoor air quality model CONTAM developed by the US National Institute of Standards and Technology. 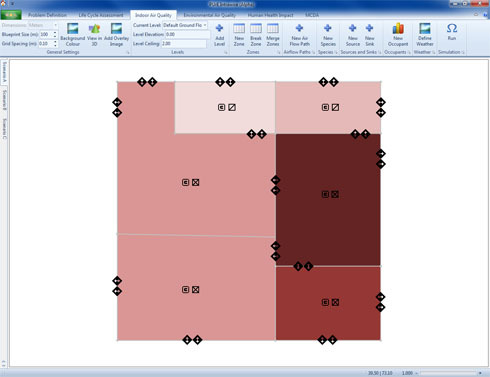 Using this interface a generic building representing a property in London was modelled and simulated with the domestic cooking emissions relating to each of the three scenarios. The results of the indoor air quality simulations show the pollutant levels throughout the property and once imported back into PUrE it is possible to identify the exposure to PM2.5 of individuals living within the property under each scenario. Whilst this analysis was limited to investigating only PM2.5 emissions and exposure for a more extensive analysis a range of pollutants and related health impacts could easily be assessed. Human Health assessment is undertaken within the Graphical Information System (GIS) built into PUrE. This allows for spatial data such as populations, outdoor air quality, building locations and sources of pollution to be represented spatially. For this analysis population data for the Greater London Assembly Constituencies was imported along with an Ordnance Survey map of London. 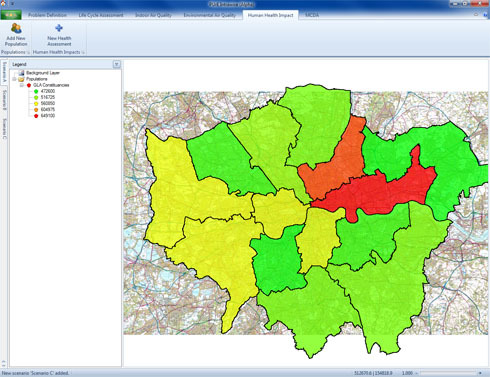 The constituencies would be used to show spatial variations in health impact within the Greater London population. A Human Health assessment was undertaken using the air quality data determined above and the imported population data. Values for total changes to the life expectancy of the population of London and each of the GLA Constituencies were calculated for each of the three scenarios. Both the calculated changes in life expectancy and human toxicity derived from the life cycle assessment earlier were recorded by the software ready for the multi criteria decision analysis. In order to best address the economic impact of switching from gas to electricity an economic indicator of annual energy cost per household has been used. Because this economic model isn´t available from within the PUrE Software the values for each scenario have to be calculated from literature values off line and then entered into the software analysis. 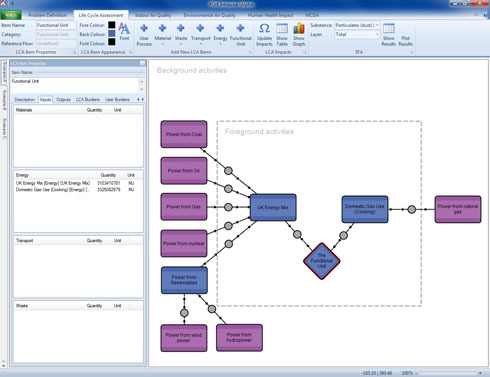 The indicator can then be used in the decision analysis within the PUrE software. It was decided to undertake one MCDA for each technique and assume the role of Policy Advisor when assigning importance to the various social, economic and environmental indicators. 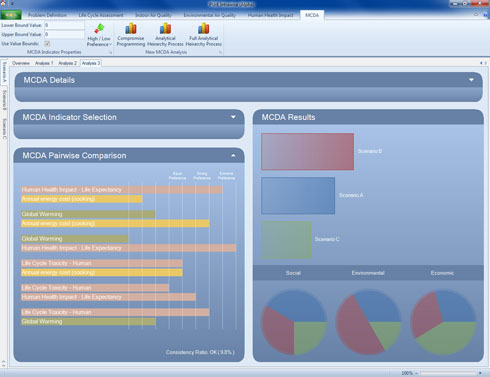 Whilst undertaken at a screening assessment level and incurring a wide range of assumptions along the way, this example has clearly shown the strength of the PUrE software in aiding the user to assess complex decisions involving a range of economic, social and environmental criteria. DEFRA, 2009. Saving energy through better products and appliances: a consultation on analysis, aims and indicative standards for energy efficient products 2009 - 2030 (Annex 12).